Wikipedia says elegance is “the attribute of being unusually effective and simple”. I think the word “effective” here is very important. Essentially, if a strategic game is our goal, the more strategy we can create with the fewer (and thus more “effective”) rules, the more elegant the game design. Obviously, fewer rules equals a simpler design. Thus a simple game with complex strategy is elegant. When I say a video game is elegant, (or board game, or a piece of art, or music), I actually mean it is deceptively complex. It may seem simple, either through simple rules, or simplicity of design, but through the interactions of those, it turns out to have some hidden complexity. For example, the rules for chess are fairly simple, a child can learn them, but the strategy that emerges from these rules is incredibly complex and there have been literally hundreds of books written about it. When I play board games or video games, I have always appreciated this simplicity that leads to complexity. So far, even without necessarily thinking about these concepts explicitly, I have also attempted to incorporate elegance into my own game designs. There is a whole camp of board games that doesn’t even attempt simplicity. If you’ve played a lot of board games, you probably know what I mean, rule books that are 20 pages long are not all that uncommon. I would generally have called them ‘ameritrash’ before today, (although the term is stupid for many reasons, not the least of which is that not all games with that monkier come from america) but then I read the board game geek page on ameritrash, and realized that I’ve been thinking of that term slightly differently from its commonly accepted use. The wiki page emphasizes the importance of theme in these games, and luck. It’s probably the luck I have a problem with, though that is not in opposition to simplicity and emergent complexity. Anyway, let it suffice to say that there are a whole crap ton of games out there with what I’ll call now ‘rules complexity’, by which I mean that the game is complex, but that complexity comes more from complicated rules than elegance of design. Essentially, this is a two-player game, so you play on one side or the other. On your side are six fairly large buttons, one for each color. The colors that are situated across from one another are opposites (in the standard color wheel, google for “color wheel” if you don’t know what I mean), and they cancel each other out when they contact. You press a button, to select a color, and then touch in any of the six rows to “send” a piece down that row. The gameboard is only 6×6, so it’ll fill up pretty fast. Right now I’m thinking two game modes, both limited to 100 moves, or “sends” of pieces across the board. 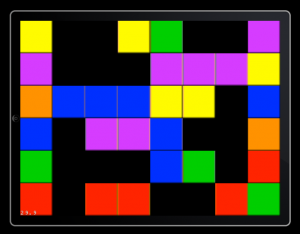 Mode 1 will be “real time”, where you are basically sending blocks as fast as you can to out-race/color match your opponent. Mode 2 will be “turn based”, where you make a move, then your opponent makes a move. When the 100 moves are over, whichever side has the least pieces on it is the victor’s. I actually think the jury is still out on whether this game will have emergent complexity. There are a lot of choices at any given time (well, 36, I guess–maybe that’s not so many), but the problem as I see it is that for every move you make, your opponent has exactly one move that will counter it. The game, especially in a turn-by-turn mode, could easily stalemate. I haven’t really thought of a good “fix” for that problem… then again, it was made in a night. This entry was posted in Game Jams, Game Theory, My Games by Martin. Bookmark the permalink.